There are so great bars to frequent when you visit the capital city, so I have compiled a list of the coolest bars in London for you, all of which I have tested out. There are many different types of bars to check out when you visit London. Gastropubs, cocktail bars, gay bars, quirky bars, hotel bars, rooftop bars, and wine bars- just decide what kind of place you’d like to be at and pick one. When in London, one of the first things people ask is “where are the coolest bars in London to knock back a pint? “. Well, that’s a perfect question because we’ve already got the answers. Here is INSIDR’s selection of the 9 coolest bars in London! So take a sip of your drink, enjoy the ambiance, and the most important of all; have a great time! Who wouldn’t want to enjoy some good food along with a nice chilled drink? Oystermen – as you can also guess is an oyster bar located in Covent Garden area. If you are a seafood person who would like to have a drink in a rustic bar with delicious food, this place will make you a great addition to your to-visit list in London. Without a doubt, the oysters are fresh and fish options are great and seasonal. The staff is very professional and helpful too – they know what they are working on. It’s a really nice place to spend for a light meal or for pre-drinks, thus a sure thing for our list of the coolest bars in London. Humble Grape is not only one of the coolest bars in London in our view, but it is also widely known as one of the best wine bars in London. There are other locations as well as in the town. The aim of the bar is to make wine accessible to everyone. This means they have many kinds of wine at affordable prices as well. The wines here are mostly organic, biodynamic and sustainable wines from small-scale or family-run wine producers from all over the world. You can choose a cheese or meat plate to accompany your wine but also opt for a larger dish like Cote de Boeuf. They also hold wine tasting events each month. In addition to what you drink there, you can also buy a bottle of wine if you like! The Savoy has become a symbol of London over the years and it not a coincidence. The atmosphere of this place, the professional manner, and the quality is simply of the very highest degree. Just in the right place, Beaufort Bar is located inside The Savoy. The bar is actually built on the old cabaret stage of the hotel which gives a unique theatrical ambiance along with its perfect art deco furnishing. The menu is quite extensive with a variety of classic and also innovative cocktails. However, if you are feeling a bit fancier, Beaufort has a really nice selection of vintage and non-vintage champagne both by glass and bottle. It’s a very special experience here, so it rightly finds its place among the coolest bars in London. Artesian has made it into a number of different INSIDR articles, underscoring just how highly we rate it among the coolest bars in London. It is situated inside The Langham Hotel with all its beautiful and magical atmosphere. The decoration and the setting are very glamorous. The bartenders are very professional and prepare very creative presentations that can make you wow. The cocktail menu changes frequently as well so there is always something new to try and experience a new taste each time you visit. Artesian is a very popular place since years as it has been chosen as the World’s Best Bar for the last four years – that’s a big accomplishment! Along with your drinks, you can also enjoy some tapas style snacks too. Known as the best of the best, American Bar is the longest surviving cocktail bar in London. There was a trend of opening American style bars in London – meaning they were actually cocktail bars. The team has received many awards over the years including Best Cocktail Bar, Best Hotel Bar, Best Bar Team – and many others, and now they make it among INSIDR’s coolest bars in London too! In the menu, there are still famous cocktails from the 1920’s but also new creations from new team members with special glassware and unique ingredients. American Bar gives you a very impeccable time to spend; perfectly made cocktails, attentive service, a nice live music behind. What else you can ask for? Rivoli Bar is without doubt another of the coolest bars in London. It’s another hotel bar in London inside The Ritz. The place is pretty fantastic from the moment you enter in; the whole bar looks like a giant jewelry box – it was actually intended to look like this way. All staff looks perfect in their white uniforms, shaking up and preparing the cocktails. The mood in the air is pretty relaxing on the contrary to the design of the bar. You can try a variety of classic cocktails but there is also a very good selection of wine and champagne. Rivoli is great for a special date or a pre-dinner drink before an important meal! If you on the hunt for one of the coolest bars in London and are into pub food along with a delicious drink at the same time, St. George’s will help you to fulfill this desire. Here you can enjoy some traditional British dishes like the meat pie, fish and chips or a full English Breakfast in the dining room downstairs. The dining room is named Churchill’s dining hall – and filled with his photos and memories from his life. If you want a livelier place to drink, stay upstairs. The bar is very close to touristic attractions as well, so after a day visiting Westminster Abbey, Little Ben or Churchill Gardens, St. George’s is a perfect place to spend your day. You can prepare yourself for a London themed spam!✨??? Gordon’s is thought to be the oldest wine bar in the whole world. The wine selection is very extensive over here; you can find a very special one or a regular bottle. According to your budget, you can order a glass of wine or simply can order a bottle. In the downstairs, there is a candlelit area where the ceiling is pretty low. The atmosphere here is something you would like to experience; a place at least once you should visit when you are around London. Grab a bottle of wine and order some cheese and meat plate to accompany and you’re good to go! London’s oldest wine bar has a few secrets in store that make it a unique place to get a drink. Emanuel, Supervisor of Sales and Services at Air Transat, show us around Gordon’s Wine Bar. 🍷 Le plus vieux bar à vin de Londres cache de nombreux secrets, Emanuel, Superviseur des ventes et services nous présente les recoins du Gordon’s Wine Bar. Fumoir is another Art Deco bar in an amazing location. Even though it is very central, the bar still continues to provide a cozy and an intimate ambiance towards guests. The bar is situated inside the Claridge’s Hotel, it’s a world-famous hotel known around the world. The Fumoir is also being an example of the hotel both with their work and also the service here. The cocktails are masterfully crafted so no bad surprises about them. The Fumoir is great for pre-dinner date occasions for an aperitif or maybe even a place to end the night with a nice cocktail. 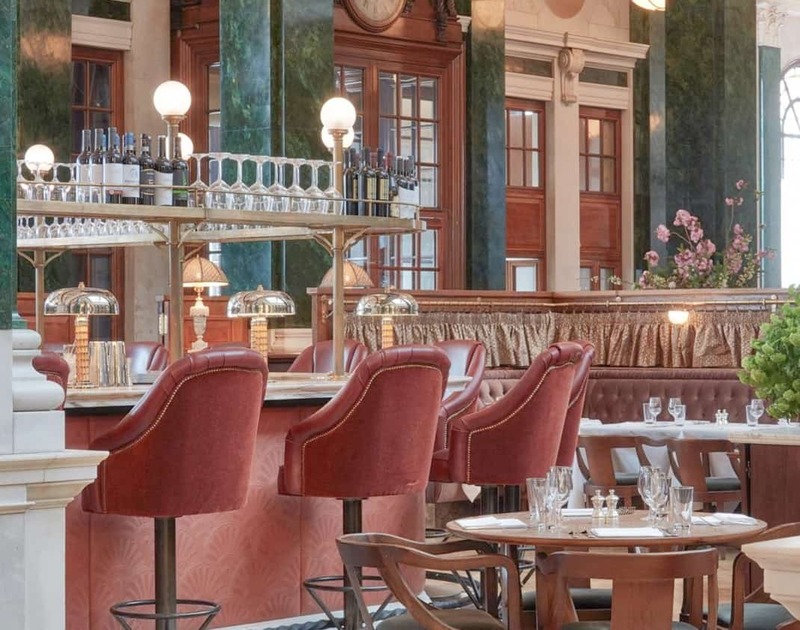 The grandeur of the hotel and the suitability of the bar to many different occasions ensures its place in our list of the coolest bars in London.